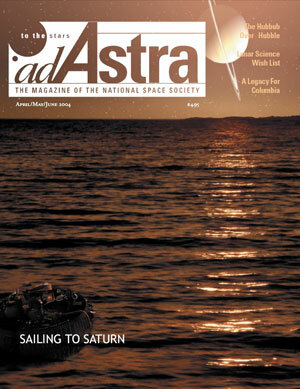 ON THE COVER: Nightfall on Titan seas, as imagined by Slovenian artist Gregor Kervina. Saturn’s largest moon is a primary focus of the Huygens-Cassini mission, scheduled to begin in July. The image depicts the Huygens probe floating in a methane/ethane lake believed to exist beneath the hazy atmosphere of Titan. Photo: NASA. NASA’s decision to end servicing missions to the Hubble Space Telescope ignites a wave of controversy over the meaning of acceptable risk. Democrats take issue with Bush space initiative. With the new Moon initiative researchers can break new ground on lunar studies. A seven-year space voyage ends in July with the arrival of NASA’s Cassini spacecraft and Europe’s Huygens probe at Saturn. The new vision could end up being a first step in the long-term development of space, and hence the best tribute imaginable to Columbia.